Update 4/5/19: Some other sites were saying that these deals would end on April 5th, that was only the offers on affiliate links. Increased offers for both these personal and also the business cards are still available through May 1st with referral links. Delta Sky Club access (can also bring two guests for $29 per person. Keep in mind you must be arriving or departing on a Delta marketed or operated flight to be eligible for access). Authorized users also get this access, previously they were $175 each but possibly free now? This is the best public offer we’ve seen on the Platinum card, previous best was 70k + $100 + 10k MQM (that deal might have been better depending on how you value the MQM). We’ve seen better offers on the Reserve & Gold card before and better targeted offers on the Platinum as well. Remember this offers all contain the once per lifetime language so you’re not eligible if you’ve had the cards before. Personally I wouldn’t consider the Gold or Reserve, but the Platinum might be worth considering especially if you’re self referring and have an immediate/near need for Delta miles. Otherwise it might make sense to just wait for a better offer to come along. I’ll likely add the Platinum card to our list of the best credit card bonuses. Before applying make sure you read these things everybody should know about American Express cards. Not much. 10k DL miles is a pittance compared to the other offers, you should be able to go through your referral link and see other personal cards to see the Gold, Plat and Reserve offers and use those as your referral links. If you hold any other Amex cards check if they can refer to the DL cards and use whatever card offers you the highest referral bonus to create your links. “Instead you can share them in this linked post ” – Link is not provided. Is there a reason my comments disappears when I post my referral? Is it being deleted, or…? I’m sure I’m abiding by the rules. Can you find mine in spam and approve if you agree? Breathe man. Referral links often go pending for approval. They will clear through the comments, but there’s a lot of us and only 1 (or 2 in total) of them and they do have lives outside of the blog. These offers are good through 5/2 so they aren’t gonna disappear overnight. Have we seen a better offer for the Reserve? – Really disappointed I missed the $100k offer. And I thought missing the CSR leaked link or the Thanksgiving Amex Plat leaked link were lifelong churning regrets! But no referrals on those yet. Hope they get referral offers for the biz in the next couple days! William Charles this has been mentioned several times but the Platinum/Platinum biz had 80K + $100 which I would consider to be the best ever. You have a typo in your targeted offer Delta post that states Gold had that offer but it is the platinum. 80k + $100 wasn’t publicly available was it? Sorry, yes you are correct, it was targeted. In any case, I believe the below page should be updated as it states “Delta Gold 80,000 miles + $100 statement credit.” Should state Delta Platinum, correct? Have there been better offers for the Reserve? According to a quick search on DOC, the highest ever (since like 2017) has been 70,000 miles with 4k spend. This offer is 75,000 miles with 5k spend. Granted, not sure if 5k Skypesos is “worth” $1,000 spend, but since Amex delta are once/lifetime (or 7 years) and there’s a limit to 5 Amex cards you can hold at any given time, it would seem prudent to go for the highest bonus possible, no? Where are you seeing that these are available until May 1, 2019? 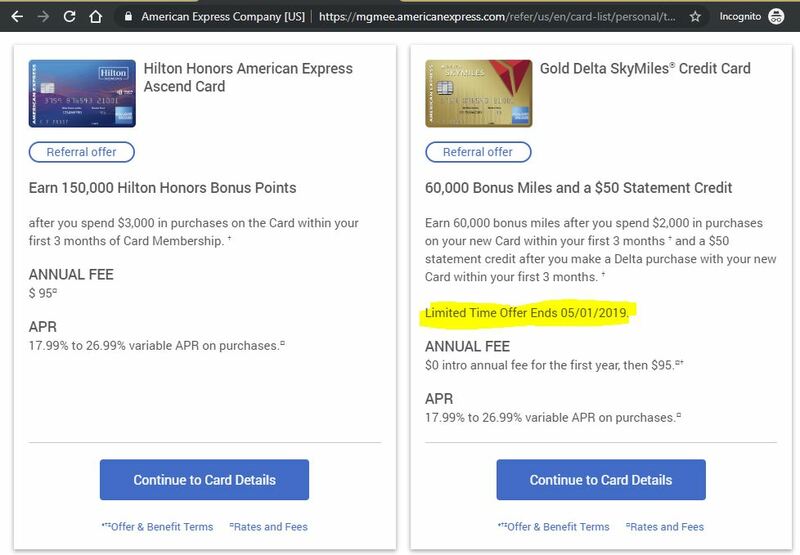 On Amex website, the Reserve one is only available until 4/3/19. If you use a referral link. FWIW, the terms state that the bonus MQMs don’t count toward a status challenge, but I got the card in late 2017 and the 10k MQMs got me over the 12.5k I needed for a status match/challenge. Can u get the biz via referral? FYI- the $50 SC on the delta gold requires a qualifying Delta purchase. SJ If you are able to get 60k+$50 through Amex self referral, that would be the better offer.